Still a few booth spots remaining for the Old House Fair, the popular daylong festival in South Park (30th & Beech St.), on Saturday, June 18, 2011. 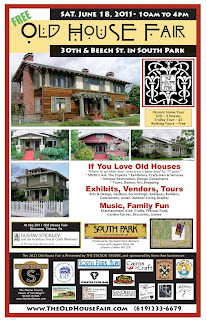 For exhibitor applications, visit the website at www.TheOldHouseFair.com, or call 619-233-6679. The Station Tavern & Burgers is presenting sponsor of The Old House Fair, and community sponsors include South Bark Dog Wash, Alchemy, Grant's Marketplace, the Whistlestop Bar, Hamilton's Tavern, Cairns Craft, and Home Remodeling of San Diego. Also needed are volunteer docents for the Historic Home Tour. Contact winter.christine@gmail.com to volunteer.